Have you ever had a cucamelon? These adorable little fruits are a ton of fun to grow and eat. They taste like a citrusy cucumber and can be eaten pickled, tossed into salads, or fresh from the garden. The tangy, bright flavor and mini-watermelon look makes these melons a big hit with everyone, and if you are gardening with kids these cute baby melons are an effective way to show little ones the magic of the garden. 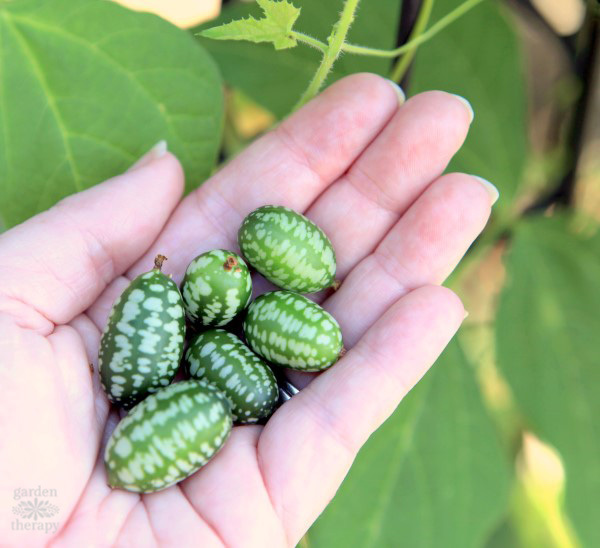 Cucamelons (Melothria scabra), also called “Mexican sour gherkins” and “mouse melons” are native to Central America. Although they are not a fruit we see that often today, they were a very common part of the diet of ancient Aztec people. The little fruits look like tiny, grape-sized watermelons but have a zingy taste more like a cross between a cucumber and a lemon or lime. They are packed with antioxidants, vitamins, and minerals, so adding cucamelons to your diet can really improve your overall health. When you start anything from seed, be sure to use a sterile growing medium as garden soil often contains bugs that can damage delicate seedlings. For information on how to give any seeds their best start, read Seed Starting 101. 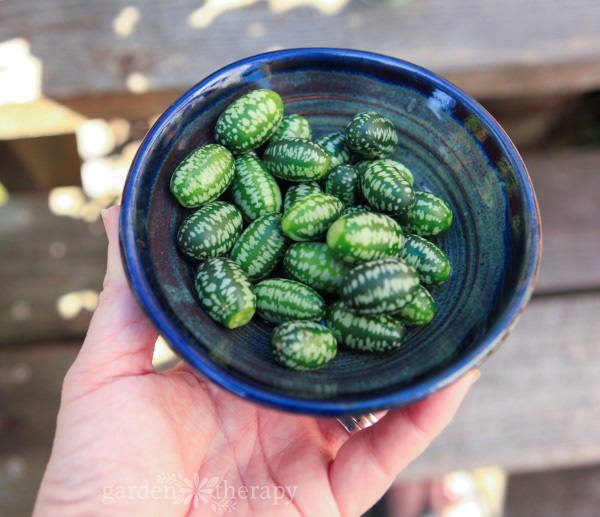 When I first started growing cucamelons I found a lot of conflicting information out there. As a trendy crop for the home garden, I think there are some articles that have popped up from gardeners who may not have grown them personally. 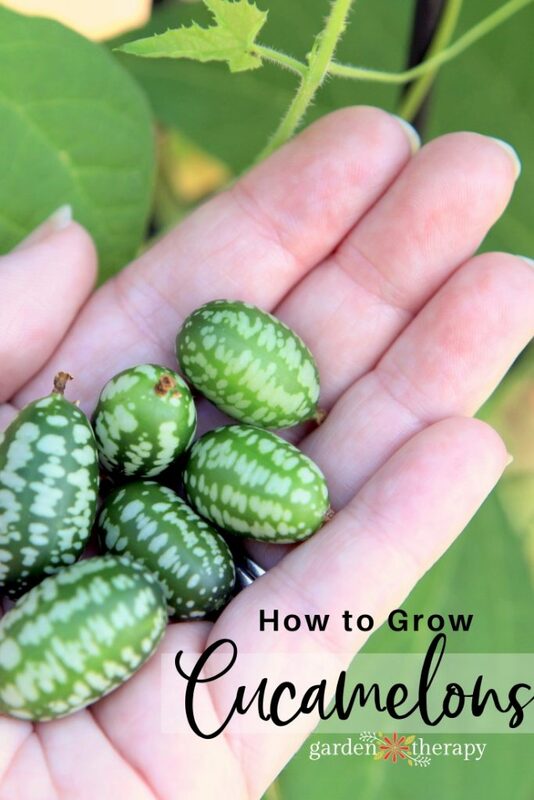 I have been growing cucamelons successfully now for three years, but I wanted to be sure that I gave you the best information possible, so I asked a few cucamelon experts—Kristin Crouch of That Bloomin’ Garden and Veggie Garden Remix author Niki Jabbour—for advice on growing cucamelons. Have patience with the seeds. Cucamelons are tricky to germinate if growing from seed. Plant the seeds in seed starter mix and place the pots on heat mats in a cool greenhouse. It can take up to three weeks for seeds to germinate. Once they have their second set of leaves, pot each plant up to its own 4” pot with good potting soil and a pinch of organic fertilizer. Transplant outside after hardening the plants off for a week. Plant them outside when it’s around 10 degrees C (50 degrees F) at night consistently. Give cucamelons a tall support structure. 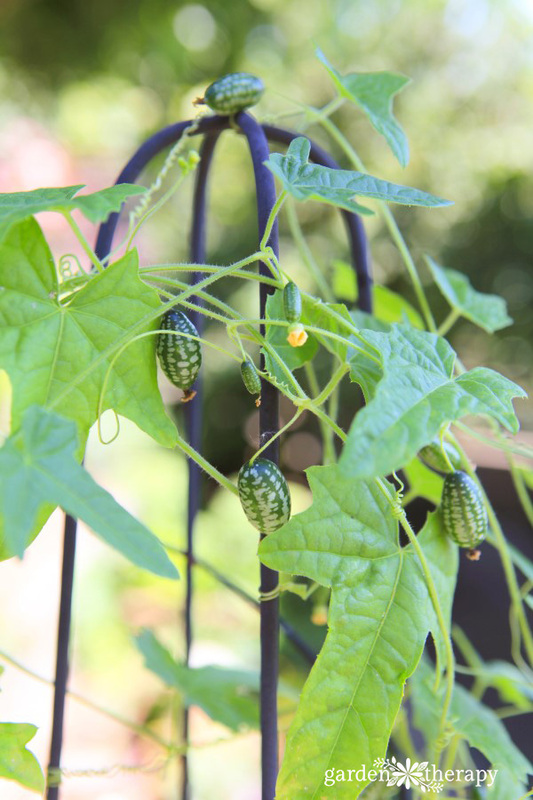 Use at least 5′-6’ high supports as the cucamelon vines cling like peas do and can grow quite tall. 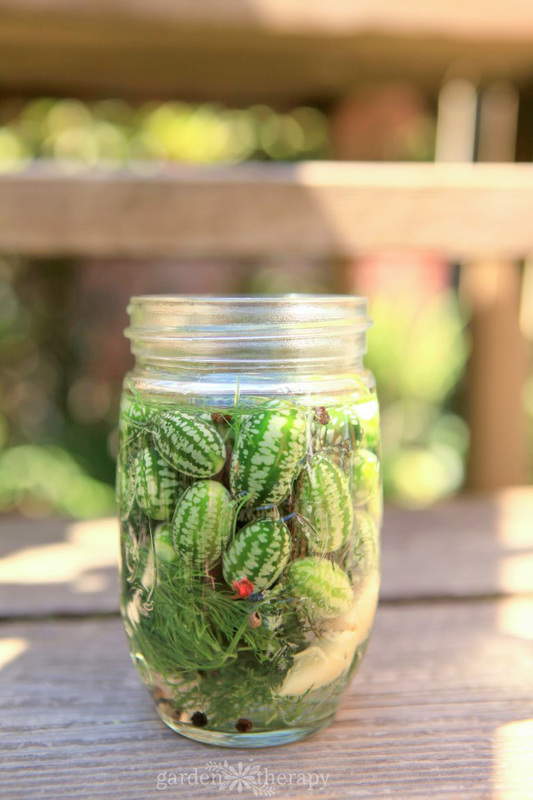 Save the seeds from cucamelons and ferment them like you do with tomatoes (see how to do that here). 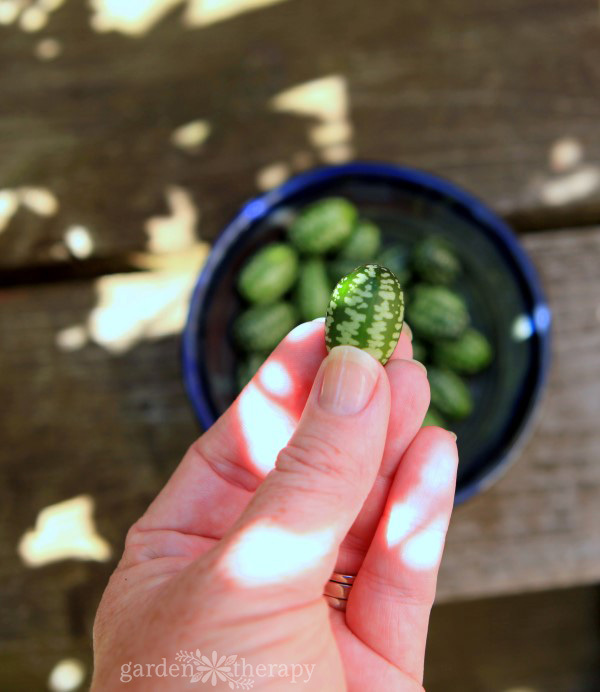 Because the cucamelons are in a plant family of their own and not related to cucumbers, their seeds come back true each year. 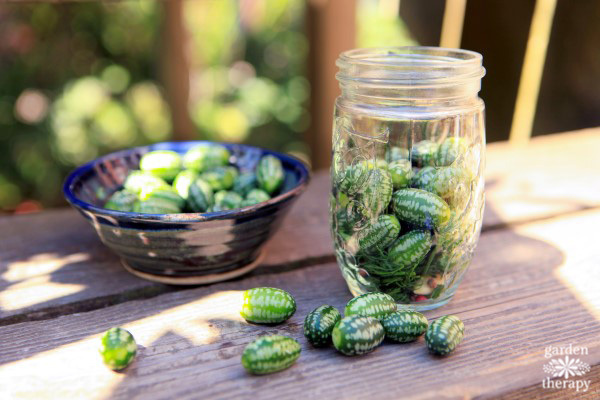 Cucamelons will tolerate a cooler spring better than cucumbers do, and once they’re established, they are quite a bit more drought tolerant. Heat, sun, and rich soil are the keys to growing success with these plants, so pick a site with full sun and amend the soil with aged manure or compost. People with limited growing space can plant them in large pots on a deck or patio; just be sure to provide something for the vigorous vines to climb. About a week after you see the first flowers, begin checking for ripe cucamelons. They tend to hide behind the foliage, so look closely. Once they’re about an inch long, start picking. The sourness of the skin intensifies as the fruits age, so pick them young if you want to minimize the citrus bite. Excerpted from Niki Jabbour’s Veggie Garden Remix © by Niki Jabbour, used with permission from Storey Publishing. Now that you’re growing these mini melons, what do you do with them? They taste bright and refreshing, like a cucumber mixed with a lime, and go well in both sweet and savory dishes to add a little zip. Cucamelons are ready to harvest and eat when they are about the size of a grape and feel firm to the touch. Eat them fresh from the garden. No need to remove the peel. Just pop them in your mouth! Pickle them. Eat on their own or add to sandwiches and wraps. Use a whole one as an unexpected garnish in your favorite cocktail or lemonade. Chop them up and add to salsas and salads for a bright flavor. Cook them in a stir-fry. What’s your favorite way to eat cucamelons? Let us know in the comments! I found mine online in Thompson and Morgan’s seed catalogues! Can’t wait to get going! I have about 10 that germinated the first week. I know the others will take time, but I’m happy with the ones that already popped. I want to see how many I can harvest at one time from an 8′ by 4′ raised bed. Then I want to discover ways they could be used in a party, or reception type setting. I have a lot to learn this season! Hi Jeff, you are going to have a LOT of cucamelons! I grew 2 plants last year and we were overflowing with them after eating them daily and giving buckets of them away. They are prolific fruiters!